Cochrane Reviews have recently started including the quantity I2 to help readers assess the consistency of the results of studies in meta-analyses. What does this new quantity mean, and why is assessment of heterogeneity so important to clinical practice? Systematic reviews and meta-analyses can provide convincing and reliable evidence relevant to many aspects of medicine and health care.1 Their value is especially clear when the results of the studies they include show clinically important effects of similar magnitude. However, the conclusions are less clear when the included studies have differing results. In an attempt to establish whether studies are consistent, reports of meta-analyses commonly present a statistical test of heterogeneity. The test seeks to determine whether there are genuine differences underlying the results of the studies (heterogeneity), or whether the variation in findings is compatible with chance alone (homogeneity). However, the test is susceptible to the number of trials included in the meta-analysis. We have developed a new quantity, I2, which we believe gives a better measure of the consistency between trials in a meta-analysis. Tests for heterogeneity are commonly used to decide on methods for combining studies and for concluding consistency or inconsistency of findings.5 6 But what does the test achieve in practice, and how should the resulting P values be interpreted? A test for heterogeneity examines the null hypothesis that all studies are evaluating the same effect. The usual test statistic (Cochran's Q) is computed by summing the squared deviations of each study's estimate from the overall meta-analytic estimate, weighting each study's contribution in the same manner as in the meta-analysis.7 P values are obtained by comparing the statistic with a χ2 distribution with k-1 degrees of freedom (where k is the number of studies). Conversely, the test arguably has excessive power when there are many studies, especially when those studies are large. One of the largest meta-analyses in the Cochrane Database of Systematic Reviews is of clinical trials of tricyclic antidepressants and selective serotonin reuptake inhibitors for treatment of depression.13 Over 15 000 participants from 135 trials are included in the assessment of comparative drop-out rates, and the test for heterogeneity is significant (P = 0.005). However, this P value does not reasonably describe the extent of heterogeneity in the results of the trials. As we show later, a little inconsistency exists among these trials but it does not affect the conclusion of the review (that serotonin reuptake inhibitors have lower discontinuation rates than tricyclic antidepressants). Since systematic reviews bring together studies that are diverse both clinically and methodologically, heterogeneity in their results is to be expected.6 For example, heterogeneity is likely to arise through diversity in doses, lengths of follow up, study quality, and inclusion criteria for participants. So there seems little point in simply testing for heterogeneity when what matters is the extent to which it affects the conclusions of the meta-analysis. We developed an alternative approach that quantifies the effect of heterogeneity, providing a measure of the degree of inconsistency in the studies' results.14 The quantity, which we call I2, describes the percentage of total variation across studies that is due to heterogeneity rather than chance. I2 can be readily calculated from basic results obtained from a typical meta-analysis as I2 = 100% x(Q - df)/Q, where Q is Cochran's heterogeneity statistic and df the degrees of freedom. Negative values of I2 are put equal to zero so that I2 lies between 0% and 100%. A value of 0% indicates no observed heterogeneity, and larger values show increasing heterogeneity. The tamoxifen and streptokinase meta-analyses, in which all the included studies found similar effects,16 17 have I2 values of 3% and 19% respectively. These indicate little variability between studies that cannot be explained by chance. For the review comparing drop-outs on selective serotonin reuptake inhibitors with tricyclic antidepressants, I2 is 26%, indicating that although the heterogeneity is highly significant, it is a small effect. The reviews of trials of magnesium after myocardial infarction (I2 = 63%) and case-control studies investigating the effects of electromagnetic radiation on leukaemia (69%) both included studies with diverse results. The high I2 values show that most of the variability across studies is due to heterogeneity rather than chance. Although no significant heterogeneity was detected in the review of amantadine,11 the inconsistency was moderately large (I2 = 44%). 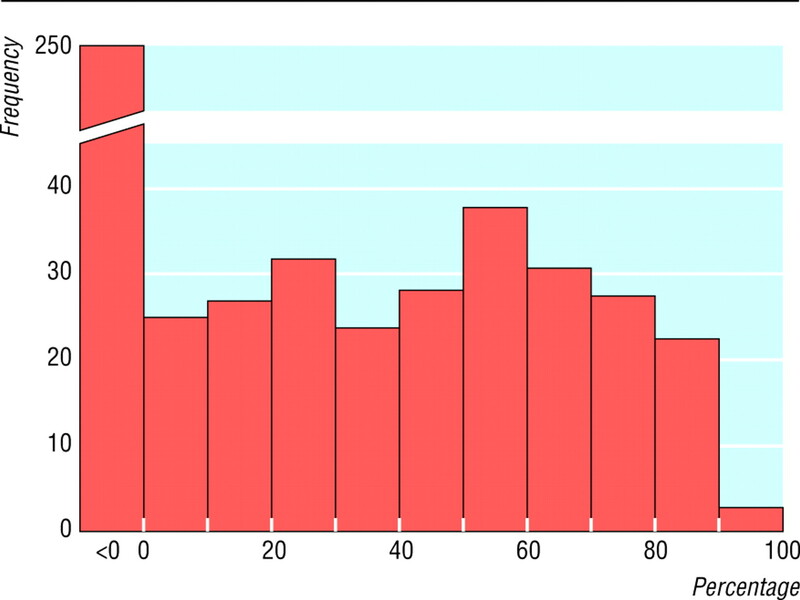 Figure 2 shows the observed values of I2 from 509 meta-analyses in the Cochrane Database of Systematic Reviews. Almost half of these meta-analyses (250) had no inconsistency (I2 = 0%). Among meta-analyses with some heterogeneity, the distribution of I2 is roughly flat. I2 can also be helpful in investigating the causes and type of heterogeneity, as in the three examples below. Figure 3 shows the six case-control studies of magnetic fields and leukaemia broken down into two subgroups based on assessment of their quality.19 If heterogeneity is identified in a meta-analysis a common option is to subgroup the studies. Because of loss of power, non-significant heterogeneity within a subgroup may be due not to homogeneity but to the smaller number of studies. Here, the P values for the heterogeneity test are higher for the two subgroups (P = 0.3 and P = 0.009) than for the complete data (P = 0.007), which suggests greater consistency within the subgroups. However, the values of I2 show that the three low quality studies are more inconsistent (I2 = 79%) than all six (I2 = 69%) (table 2). Substantially less inconsistency exists among the high quality studies (I2 = 15%), although uncertainty intervals for all of the I2 values are wide. I2 can also be used to describe heterogeneity among subgroups. Table 2 includes results for the outcome of recurrence in the meta-analysis of trials of tamoxifen for women with early breast cancer. There was highly significant (P = 0.00002) and important heterogeneity (I2 = 50%) among the trials.16 However, a potentially important source of heterogeneity is the duration of treatment. The authors divided the trials into three duration categories and presented an overall heterogeneity test, a test comparing the three subgroups, and a test for heterogeneity within the subgroups. I2 values corresponding to each test show that 96% of the variability observed among the three subgroups cannot be explained by chance. This is not clear from the P values alone. The extreme inconsistency among all 55 trials in the odds ratios for recurrence (I2 = 50%) is substantially reduced (I2 = 13%) once differences in treatment duration are accounted for. How much is too much heterogeneity? A naive categorisation of values for I2 would not be appropriate for all circumstances, although we would tentatively assign adjectives of low, moderate, and high to I2 values of 25%, 50%, and 75%. Figure 2 shows that about a quarter of meta-analyses have I2 values over 50%. Quantification of heterogeneity is only one component of a wider investigation of variability across studies, the most important being diversity in clinical and methodological aspects. Meta-analysts must also consider the clinical implications of the observed degree of inconsistency across studies. For example, interpretation of a given degree of heterogeneity across several studies will differ according to whether the estimates show the same direction of effect. An alternative quantification of heterogeneity in a meta-analysis is the among-study variance (often called τ2), calculated as part of a random effects meta-analysis. This is more useful for comparisons of heterogeneity among subgroups, but values depend on the treatment effect scale. We believe, I2 offers advantages over existing approaches to the assessment of heterogeneity (box). Focusing on the effect of heterogeneity also avoids the temptation to perform so called two stage analyses, in which the meta-analysis strategy (fixed or random effects method) is determined by the result of a statistical test. Such strategies have been found to be problematic.23 24 We therefore believe that I2 is preferable to the test of heterogeneity when assessing inconsistency across studies. We thank Keith O'Rourke and Ian White for useful comments. Contributors The authors all work as statisticians and have extensive experience in methodological, empirical and applied research in meta-analysis. JH, JD, and DA are coconvenors of the Cochrane Statistical Methods Group. The views expressed in the paper are those of the authors. All authors contributed to the development of the methods described. JH and ST worked more closely on the development of I2. JH is guarantor.
. Meta-analysis: potentials and promise. BMJ 1997; 315: 1371–4.
. Which guidelines can we trust? West J Med 2001; 174: 262–5.
. A new system for grading recommendations in evidence based guidelines. BMJ 2001; 323: 334–6.
. Moving from evidence to action. Guyatt G, Rennie D eds. Users' guides to the medical literature: a manual for evidence-based clinical practice. Chicago: American Medical Association, 2002: 599–608.
. Approaches to heterogeneity in meta-analysis. Stat Med 2001; 20: 3625–33.
. Statistical heterogeneity in systematic reviews of clinical trials: a critical appraisal of guidelines and practice. J Health Serv Res Policy 2002; 7: 51–61.
. The combination of estimates from different experiments. Biometrics 1954; 10: 101–29.
. Funnel plots for detecting bias in meta-analysis: guidelines on choice of axis. J Clin Epidemiol 2001; 54: 1046–55.
. Small sample performance of tests of homogeneity of odds ratios in k 2 × 2 tables. Stat Med 1992; 11: 159–65.
. Detecting and describing heterogeneity in meta-analysis. Stat Med 1998; 17: 841–56.
. Meta-analysis: state-of-the-science. Epidemiol Rev 1992; 14: 154–76.
. Quantifying heterogeneity in a meta-analysis. Stat Med 2002; 21: 1539–58.
. Meta-analysis in STATA. Egger M, Davey Smith G, Altman DG eds. 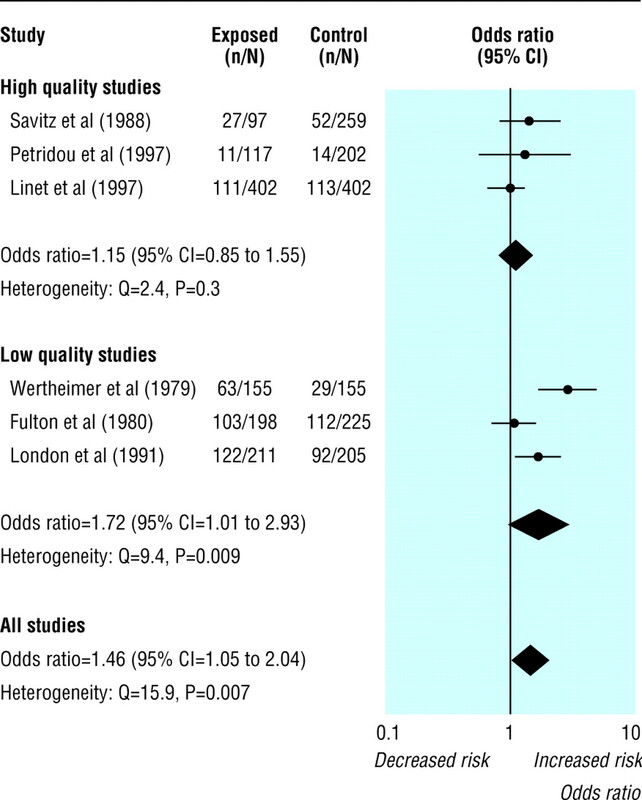 Systematic reviews in health care: meta-analysis in context. 2nd ed. London: BMJ Publications, 2001: 347–69.
. Tamoxifen for early breast cancer: an overview of the randomised trials. Lancet 1998; 351: 1451–67.
. 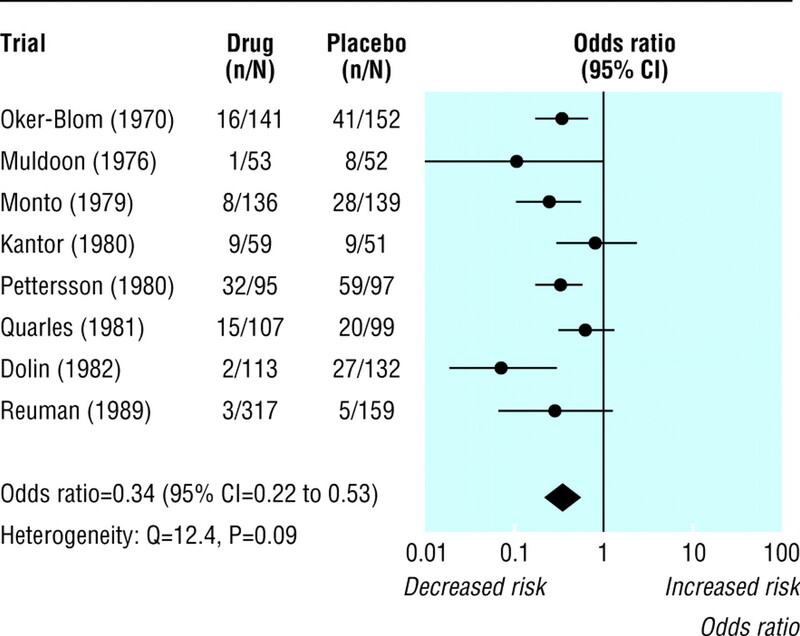 Cumulative meta-analysis of therapeutic trials for myocardial infarction. N Engl J Med 1992; 327: 248–54.
. Misleading meta-analysis. BMJ 1995; 310: 752–4.
. Residential exposure to electromagnetic fields and childhood leukaemia: a meta-analysis. Bull World Health Organ 1999; 77: 906–15.
. Human albumin administration in critically ill patients: systematic review of randomised controlled trials. BMJ 1998; 317: 235–40.
. Heterogeneity and statistical significance in meta-analysis: an empirical study of 125 meta-analyses. Stat Med 2000; 19: 1707–28.
. Issues in the selection of a summary statistic for meta-analysis of clinical trials with binary outcomes. Stat Med 2002; 21: 1575–1600.
. The performance of the two-stage analysis of two-treatment, two-period crossover trials. Stat Med 1989; 8: 1421–32.
. Stepwise selection in small data sets: a simulation study of bias in logistic regression analysis. J Clin Epidemiol 1999; 52: 935–42.